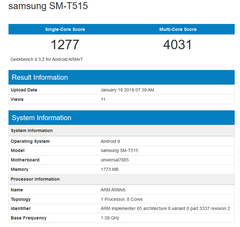 Samsung's upcoming SM-T515 tablet showed up on Geekbench earlier today with a score competitive with other mid-range Android devices. The tablet will use Samsung's Exynos 7885 SoC and 2 GB of RAM. The tablet will run Android 9.0 Pie out of the box, but other details (like size) are still unknown. The tablet is expected to make a debut at MWC 2019. Android tablets may be waning in popularity, but there are a few key players continuing to push the form factor. Samsung is undoubtedly the leader in Android tablets, and the company is cooking up a few new devices for 2019. One of these was recently seen on Geekbench. The SM-T515 is a mid-range tablet coming from Samsung later this year. 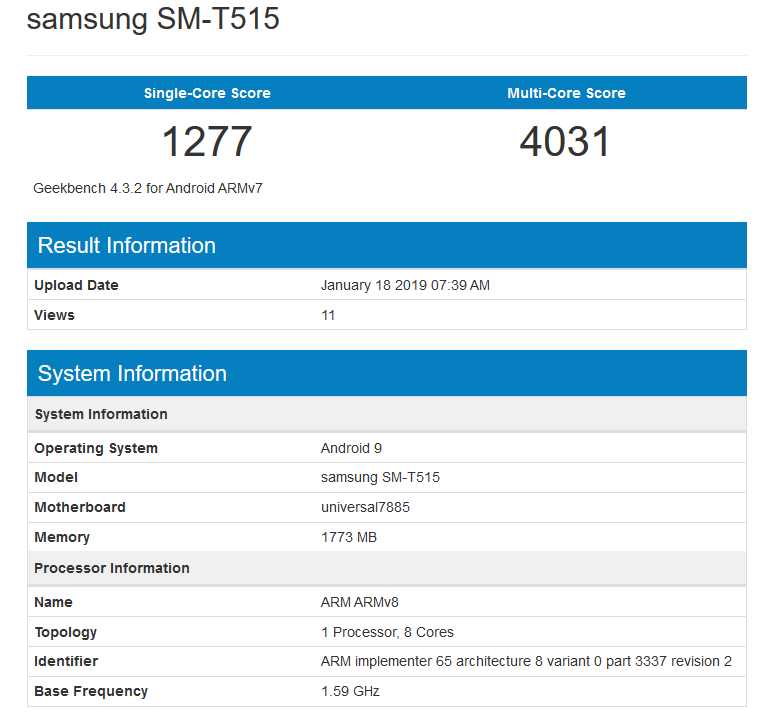 According to the Geekbench posting, it will be powered by Samsung’s own Exynos 7885. That chip may look familiar; it’s the heart beating at Samsung’s triple-camera Galaxy A7 smartphone. Featuring four ARM Cortex-A73 cores clocked at 2.2 GHz and four ARM Cortex-A53 cores clocked at 1.6 GHz, the Exynos 7885 is a decidedly mid-range chip, and the Geekbench scores echo this. The single-core score posted is 1277, while the multi-core score hit 4031. To put things in context, that’s in line with Qualcomm’s Snapdragon 625, Snapdragon 630, and older Snapdragon 810. The tablet will also feature 802.11ac WiFi, Bluetooth 5.0, GLONASS, and Galileo. Sadly, the tablet will only have 2 GB of RAM, which feels pretty puny for a modern Android device, even in this segment of the market. A last note: the tablet will ship with Android 9.0 Pie out of the box. That’s great, since Samsung has a spotty record with device updates. Details are still sketchy on the size of the tablet and whether or not it will use Samsung’s new One UI. We do know that the device will be available in Black and Silver. The SM-T515 is expected to officially debut at MWC 2019 alongside several other Samsung tablets, including the SM-T720, SM-T725, SM-P200, and SM-P205.